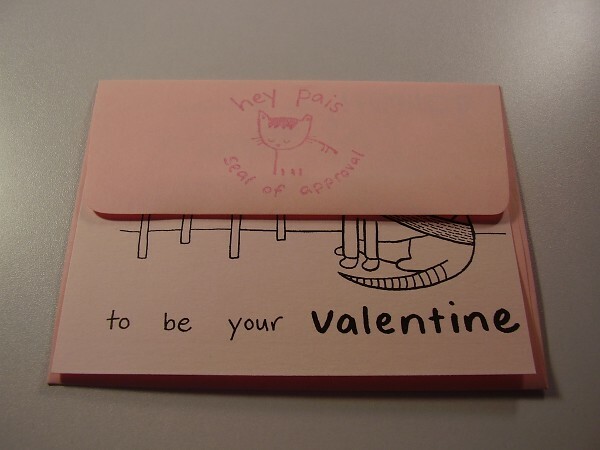 Hey Pais Valentines for sale! Things are a little bit different this year. For one thing, the valentines are bigger--I'm making them quarter-page size instead of eighth-page. 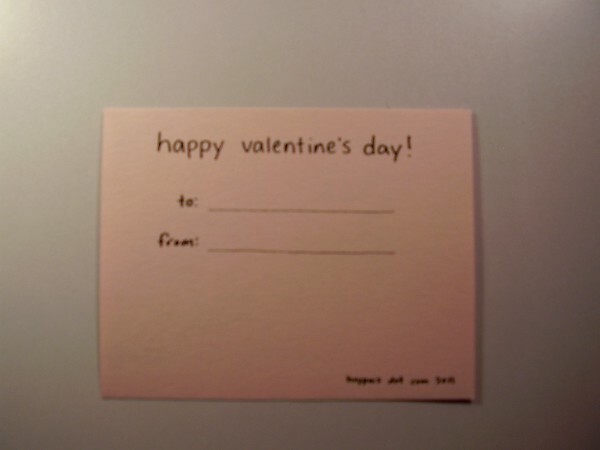 This bigger size makes them more substantial for mailing, and gives you more room to write your message of love. Another change is that if you order "black and white," un-colored valentines, they will be printed on an assortment of pretty pink paper! I have three shades of pink and one white that will be in each set. You can get them all on white if you want to color them yourself; just let me know. On to the pictures! Like the last two years, I have two different sets. 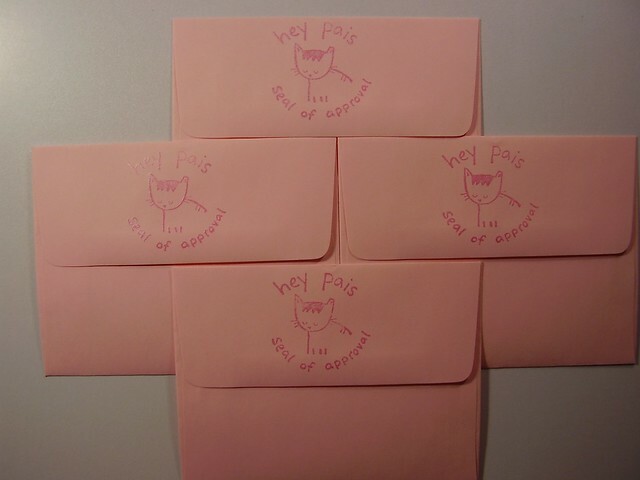 The first set is regular Hey Pais cat jokes, perfect for any cat lover or Hey Pais fan. The other set is about Star Trek: The Next Generation! The Guy and Girl have been watching this show a lot and I've gotten pretty into it. I drew myself as some of the characters! NEW THIS YEAR! Envelope sets! Each set contains four pink A2 envelopes, the perfect size for the valentines. 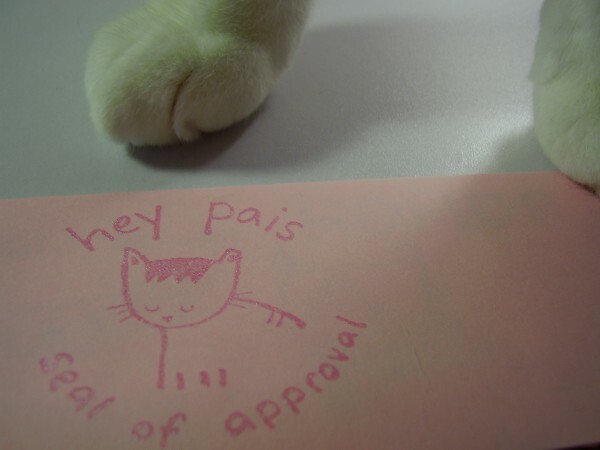 They are stamped with the Hey Pais Seal of Approval in pink shimmery ink. You will also get four red heart stickers, but they aren't pictured here because I haven't gotten them in the mail yet. 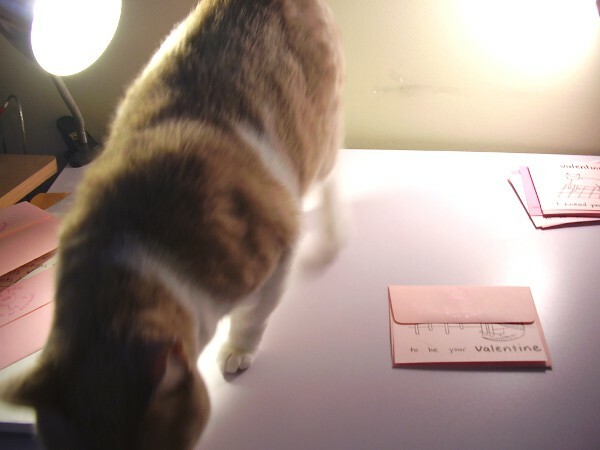 Here you can choose whether you want hand-colored (paw-colored) valentines or black-and-white valentines. Remember to pick whether you live in North America or on another continent; shipping is included. In the text box tell me if you want Cat Jokes, Star Trek Jokes, or if you bought more than one set you can get a combination. They get cheaper the more you buy! If you want envelopes, just add that to your cart before you check out. You can get as many envelope sets as you want, just update the quantity on the checkout page! EDIT 01/19/2011: The response to these valentines has been a little overwhelming! Thank you so much! 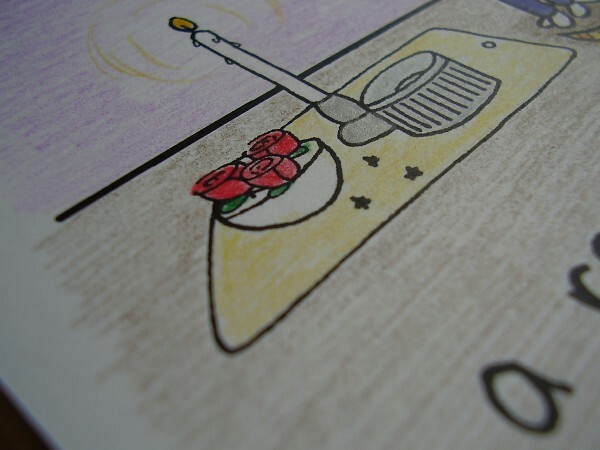 I'm going to stop orders for hand-colored valentines for a while to see how long it takes me to catch up on coloring. I will list these again if I think I have time to get to more before Valentine's Day! I'll update here on livejournal and on my Twitter. Thank you again! It will replace the medium pink for the Data cards and the "I saved you a spot" cards. The Worf cards and the "I knead you" cards will also be just slightly darker pink, but still a very pretty pastel. I hope this is acceptable! Envelopes are SOLD OUT! Thanks everyone for your support! I hope all of this makes sense! 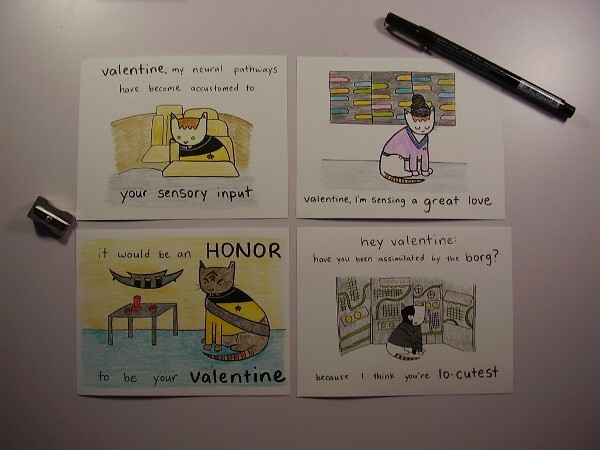 If you have any questions, or you want something special (like maybe you want a full set of Worf valentines because you are a Klingon), just email me! pais at hey pais dot com. I will help you with whatever you need! Older valentines are still available (2010, 2009). (2009 link fixed now!) If you want any of those, just email me please and I'll set it up for you! 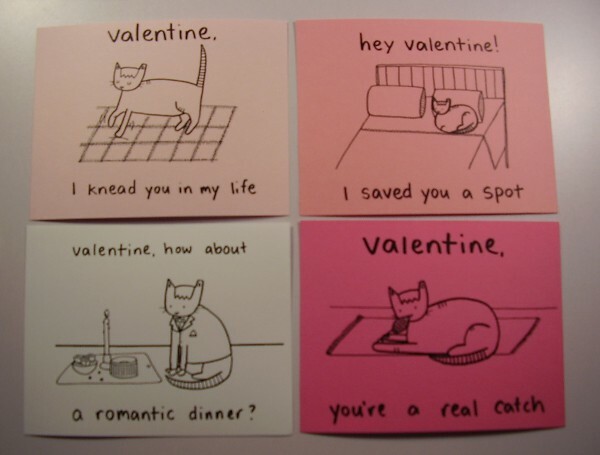 Oh my god these are the cutest. Just bought a coloured set!! Thankyou Sara! Yay! Thank YOU! And I got your email with your NZ address, I'll be sure to send them there! sweet!!!! ordered a bunch!!! can't wait! :D :D these are lovely! Totally cute! If my cats knew how to read, I'd get some for them. Well with that attitude they'll NEVER learn to read! Haha, yeah, you're right. I think Olive's much more interested in trying to catch her tail than she is in learning to read, though. I still kind of can't believe how pretty that paw is. I have never more deeply regretted not introducing Next Generation to my girlfriend. I wonder if there is time to rectify this mistake before Valentine's Day has come and gone? It's not too late! I have the 1st season DVDs, you guys can come over! STAR TREK JOKES AND KITTIES. You made it SO EASY to buy some... i just had to. Sneaky little paypal button. I tried to make it easy! :D I love your icon, too!! HEE. Kitty Star Trek! 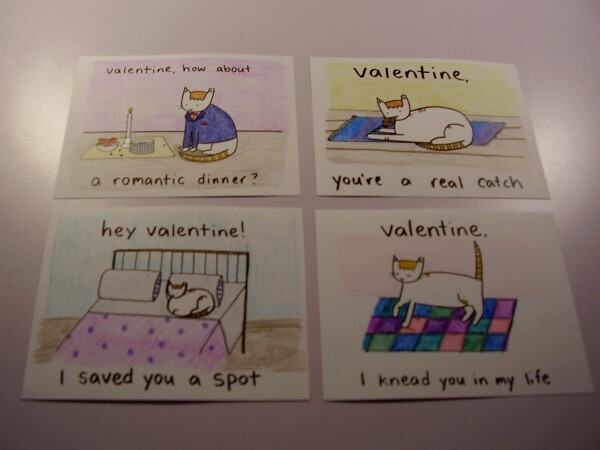 These might be the most perfect valentines I have ever seen in the history of the universe. LOVE IT! MUST ADD TO MY COLLECTIVE. OMG. Oh, thank you! How nice of you to say! And I love your icon! !